Each month, the Missouri Department of Health and Senior Services (MO DHSS) recognizes a family caregiver who is dedicated to caring for a family member or friend that needs support. 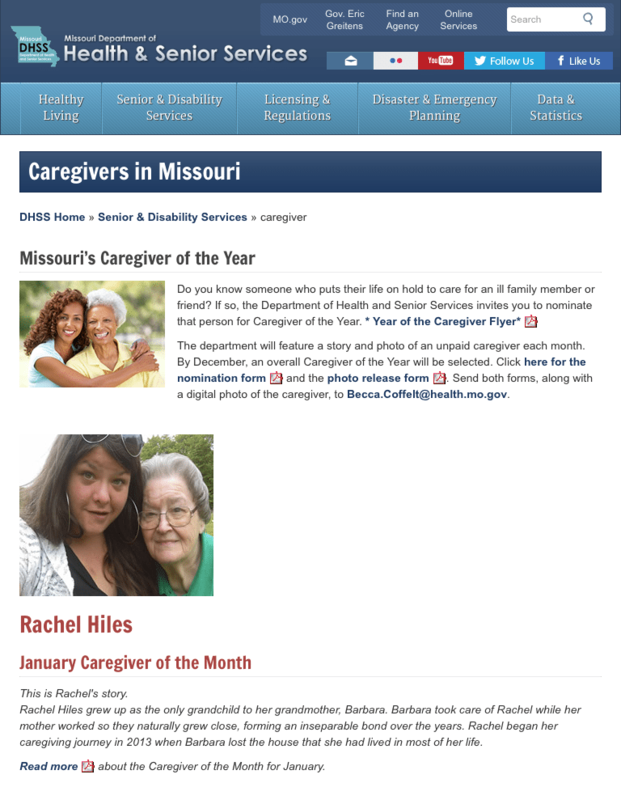 Last week, I received a call from the MO DHSS informing me that I had been nominated for Caregiver of the month. My grandma’s day lady, Karen, very sneakily nominated me. I knew something was up when she asked me to sign a photo release form! While I was agonizing about what I would say in an interview about my caregiving experience, I realized that this was a chance to do more than just bring attention to my story. It was an opportunity to help other family caregivers realize their own important roles in their carees’ lives and that there is resources and support out there, no matter what your situation. I am truly honored and appreciate the opportunity to bring awareness to family caregiving. I hope you will consider nominating a Missourian you know who goes above and beyond each day for the ones they love!